Today’s post is a colorful one. When exploring Grand Avenue in Phoenix, we found this wall surrounding a parking lot, and it was covered by a really cool mural. Now, I’m not sure where graffiti crosses the line to mural or vice-versa, but this one didn’t seem to have been created by kids on skateboards. Today’s shot reveals only a small portion of the entire scene, but I’ll post more later. This is an HDR created from three bracketed shots (-2.0/0.0/+2.0), processed in Photomatix v4. Post-processing was done in Topaz Adjust / DeNoise, and Paintshop Photo Pro X3. 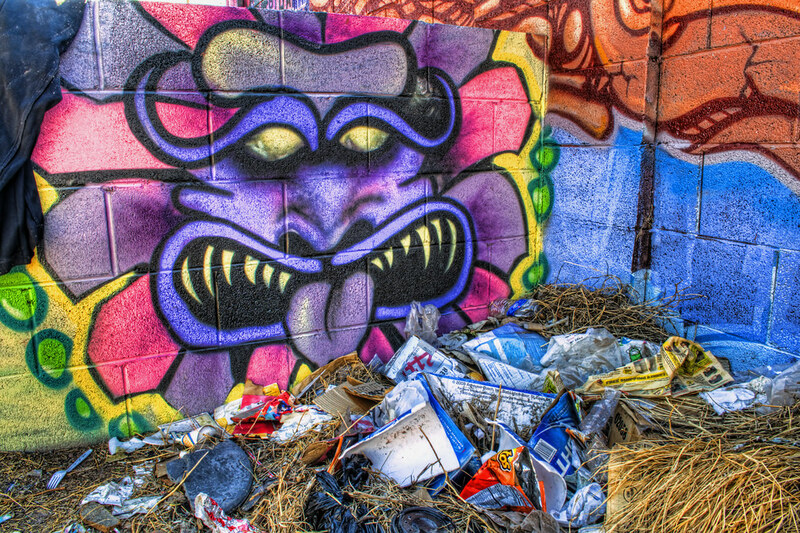 This entry was posted in Commentary, Processing and tagged Arizona, AZ, camera, D5000, debris, graffiti, Grand Avenue, HDR, mural, Nikon, Paint Shop Pro, Phoenix, photography, Photomatix, software, Topaz, trash, urbex. Bookmark the permalink. Very cleaver use of found objects, Zann.